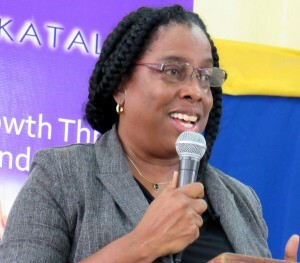 I recently attended a training session for schools in the Kingston and St. Andrew region that are participating in Katalyxt Jamaica’s Youth Innovators Competition. Katalyxt is an inspired initiative, the brainchild of businesswoman Winsome Minott. She is an accountant by training, who runs her own company, Mint Management and Finance Services Limited. A woman with great generosity of spirit, she also “gives back” through Katalyxt, which “incubates” small businesses, provides support for entrepreneurs and “unearths creativity,” in Ms. Minott’s words, through the youth competition, now in its fourth year. The competition has a solid group of sponsors. A total of fourteen school teams from Kingston and St. Andrew will compete this year, in addition to schools from St. Catherine, Clarendon, Manchester and western Jamaica. I talked to Mr. Kevin Holness, who teaches entrepreneurship at Excelsior High School, and was planning to take his group on a visit to the Branson Centre of Entrepreneurship in Montego Bay. “I want to change the mindset from that ‘hustling’ mentality,” he said. Dr. Blossom O’Meally Nelson is one of my favorite speakers. She has a delightful, self-deprecating manner, a light and witty touch, and always speaks from the heart. I have never seen her read from a sheet of paper. However, she is much more than an entertaining speaker; her words contain a great deal of wisdom. 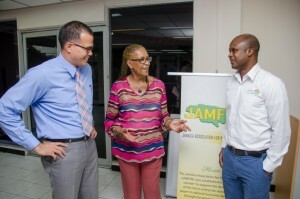 After all, as she pointed out to the high school students, she is “just” seventy-five years old (she is one of those Jamaicans – and they are quite rare – who don’t mind telling people their age) – so she has accumulated quite a bit of that worldly wisdom. Some of the young people smothered gasps; it’s hard for a teenager to imagine being that old. But Dr. O’Meally Nelson never sounded patronizing in her advice to the teenagers. She started her motivational talk by encouraging the somewhat self-conscious students to engage in a rhythmic version of a short mantra they had been chorusing earlier: “Mi a innovator, Mi a job creator, Mi a di best a di best…” It was a somewhat looser rendition than the first awkward version. It was punctuated by laughter; a bit of silliness that broke the ice. Dr. O’Meally Nelson currently chairs the Jamaica Association of Micro Financing Limited (JAMFIN), a four-year-old non-profit organization that supports micro enterprises through training, counseling and lobbying on behalf of the sector. It already has a wide network of branches. Now, what I can tell you about her career leads me to one of the very interesting points she made during her talk. 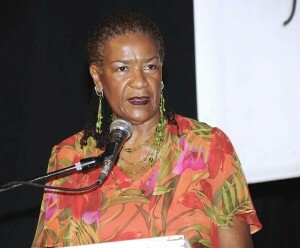 During her richly varied career, Dr. O’Meally Nelson has been a former pro-chancellor of the University of Technology (for seventeen years); educational development consultant; the first woman Postmaster General of Jamaica; management consultant; business leader in the field of logistics; and she served in two environmental non-governmental organizations. I believe also that Dr. O’Meally Nelson is, and always has been, a natural teacher, mentor and guide. The students listened intently as she spoke of taking risks and having an eye for opportunity. “Life is a process of becoming who you are,” she told them. It’s a journey, with adventures along the way. She spoke of developing an inner strength – something that takes time, of course. This steady process of strengthening and self-awareness is crucial for a young person, as he/she steps from the sheltered world of school and college into the strangely complex and unpredictable “real life” world. It is even more critical if one is setting out in business, as an entrepreneur. 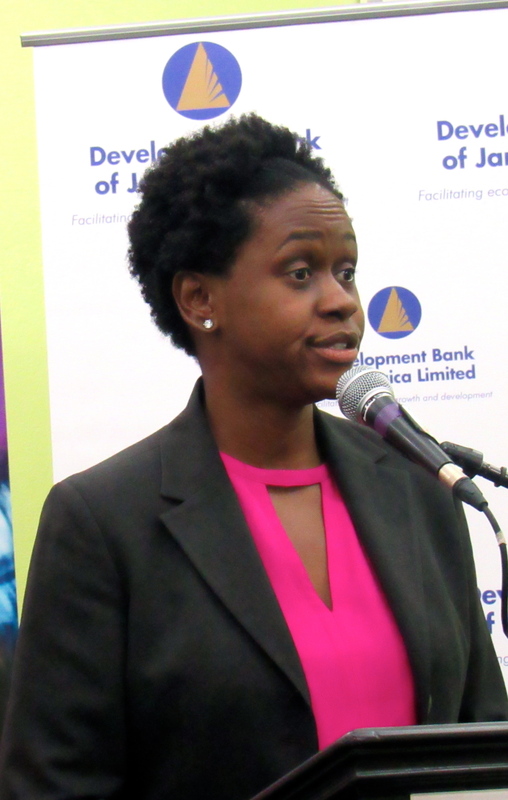 Mariame McIntosh Robinson, who spoke before Dr. O’Meally Nelson, had earlier observed that young Jamaicans are usually encouraged to become a doctor, a lawyer or an engineer. Those were the real careers. When she was growing up, she was told that entrepreneurship was the preserve of the rich and privileged, born into wealth, who could afford to take some risks and who usually had financial backing from family. Ms. McIntosh Robinson also spoke of failure in entrepreneurship almost as a necessity – but try to “fail forward,” she added, so that you can move on. Dr. O’Meally Nelson picked up on the thread of the previous speaker’s comments on career options. “Some people don’t have one true calling,” she said. She advised the students not to get stuck in the doctor/lawyer/engineer rut. There is so much more. She described a recent TED Talk that she had watched (by writer and artist Emilie Wapnick, I believe – you can look it up) in which she coined the phrase “Multipotentialite.” That person is not a dabbler or a butterfly – but someone who sees value and interest in different spheres, explores and seeks to master them. This is not just a career mindset, but also an approach to life, I believe. It is like waking up each morning and considering the day as a clean, blank slate on which anything can be written, if one puts one’s mind to it. I’ve been a bit of a Multipotentialite myself. I have been in academia, teaching, school administration, international finance, the book business, public affairs working in an Embassy…and now, writing, blogging and civil society activism. Oh, and let’s not forget my passion for birds and the environment! So – I get it. And I have been happy with all my choices; life is a never-ending learning process. One thing, though, that Dr. O’Meally Nelson stressed (and this is important – I hope the students were listening carefully to this): you must lay a solid foundation and acquire “a set of core skills” that will serve you well throughout your explorations. Otherwise, you will quickly get lost on this adventurous journey. Keep your feet on the ground, use and develop those skills to create a “saleable” you, was Dr. O’Meally Nelson’s advice. This is a woman who embraces each new challenge that throws itself in her path with alacrity and enthusiasm. Some ventures will work out better than others; but she is not the self-pitying type. This is another important trait of the true Multipotentialite.